Our puppies come with limited registration. Full registration will be considered on a case by case basis. Oscar and Ruger's puppies are $1650 and Henry's puppies are $1850. The deposit to reserve a puppy prior to the puppies being born is $250. This deposit is non-refundable unless we do not have a puppy available for you. The deposit can be paid by check made payable and mailed to Golden Rock Farm, 2807 Davis Mill Rd., Goochland, VA 23063, electronic check or credit card (4% fee). If you would like to reserve a puppy please send us an email or text letting us know you are interested in a puppy. Please let us know if you have a preference for a boy or girl. Include your full name, mailing address, phone number and any information that will help us get to know you and your family. For example: kids, other animals, is this your first golden. Once the puppies are born we will send you an email letting you know they have arrived along with some pictures of the puppies. We will also let you know what day and time you will be able to come visit the puppies so you can put this date on your calendar. We normally schedule this visit on a Saturday when the puppies are 5-6 weeks old. However, there are times when schedules require us to modify this a bit. If we have to cancel visiting day due to weather you will pick out your puppy the day they can go home. We schedule these appointments 30 minutes apart to give you plenty of time to visit and pick out your puppy. Puppies are picked out in the order we receive deposits. If you are unable to visit we can pick out a puppy for you. We do not have flexibility in the date or time of your visit due to puppies being picked out in a specific order. 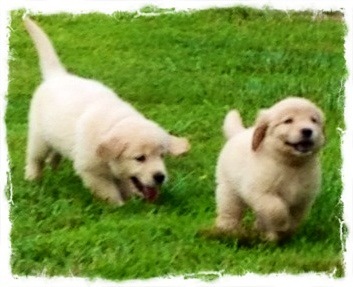 The 2nd deposit of $350 is due when you visit the puppies at 5-6 weeks, this can be paid by cash, check or credit card. The puppies can not go to their new homes until they are at least 7 weeks old. We normally schedule the puppies to go home on the first Saturday they are 7 weeks old. We will schedule this day as soon as the puppies are born so you can put the date on your calendar. If you need us to watch over your puppy for a few extra days there will be a $10 a day charge. The final payment is due when you pick up your puppy and needs to be paid in CASH. For those who prefer to pay by check, you can do so at the 5-6 week visit. The puppies will be checked thoroughly by our vet, have their first shots and a series of dewormings to ensure we are sending home a healthy, happy puppy. We will send you pictures and or videos of the puppies every week so you can watch them grow. Seller guarantees this is a purebred Golden Retriever, offspring of the previously mentioned Sire and Dam. BUYER certifies that he/she is not acting as an agent for another individual in the purchase of this dog, and will not sell this dog to any mass-producing kennel (puppy mill) or business. The purchaser promises to keep the dog in a proper manner. It shall not be kept permanently in a kennel. If problems arise concerning keeping or training, or if the dog becomes seriously ill, the BUYER agrees to consult the Breeder. Seller guarantees this dog to be free of communicable diseases as appears to the eye at the time of sale. At the expense of the BUYER, this dog is to be examined by a licensed veterinarian within 72 hours of possession to validate Health Guarantee. (If purchased on a Saturday, this requirement is extended through the following Monday.) Should this dog be found in ill health, the cause of which is clearly attributable to the Breeder, this dog may, upon written diagnosis from a veterinarian, be returned to Seller for refund of purchase price or for another dog of equal value, the choice to be determined by Seller. After said 72 hour time period, and a positive examination from the veterinarian, the health of the puppy is guaranteed for one year from hereditary or genetic life threatening diseases. Owner must provide vet records to initiate the guarantee, all records will then be reviewed and diagnosis confirmed by our vet. This guarantee is VOID if puppy is bred before it reaches 12 months of age. The puppy is guaranteed to be in good health to the best of my knowledge. All puppies sold by Golden Rock Farm come with current vaccinations and deworming. A shot record is included with each puppy. No puppy will be replaced that fails to have the proper veterinary care. No puppy will be replaced that has not maintained a healthy weight according to the AKC guidelines. Guarantee starts when the puppy is 7 weeks old. There are certain disorders that may be caused by environmental factors, i.e. : allergies, thyroid dysfunction, parasites (roundworms, coccidiosis, etc. ), demodectic mange and other autoimmune disorders that are not covered by this guarantee. Death: This puppy comes with a one-year guarantee against death due to any genetic disorder. In case of death, a necropsy stating the cause of death would be required before a replacement puppy at the cost of BUYER. No money is ever refunded. No replacement can be made until A.K.C or C.K.C. Registration papers are returned if provided. There is no guarantee of the puppy’s ability to breed or whether the animal will be show quality. The adult size and appearance are not guaranteed. We do not give cash refunds, it can take up to 1 year for a puppy replacement. We do not pay vet bills under any circumstances. No puppy will be replaced that fails to have the proper veterinary care and has not received all required vaccinations. This contract is for the person purchasing the puppy. It is null and VOID if transferred to another person. In the event that this guarantee is exercised it would be subject to the availability of another litter. It could take up to one full year. All vet records and AKC registration paperwork must be returned with the puppy in order to receive a replacement puppy. Purchaser understands that this pet may at no time be taken to an animal shelter or rescue organization. Purchaser agrees to bring this dog back to Golden Rock Farm if there is a need to surrender the animal. Upon return of this pet to Golden Rock Farm, the previous owner gives up all rights of ownership and will not receive any form of compensation. The breeder guarantees a healthy companion pet, but does not guarantee adult size, color, or temperament. Nor does breeder guarantee fitness for breeding. A.K.C papers or other registration papers will be supplied or mailed as soon as breeder receives them. This contract supersedes any and all previous agreements. A licensed Veterinarian will examine this puppy within 72 hours of receipt. If the puppy is returned due to illness, a verified letter from the veterinarian is required. This includes death or illness from any health condition deemed present prior to removal from Golden Rock Farm premises. Due to unknown hereditary and environmental causes of defects of the hips, elbows, eyes and heart no guarantee will be given against them. That however, should said puppy be diagnosed by a board certified specialist as being affected by one of the above defects, the Sellers will at their discretion take the puppy back and replace it with a puppy from another breeding within one year for hips and all other genetic defects. This dog will be given proper medical care including, but not limited to vaccinations and annual boosters, regular de-worming, adequate and proper shade and housing in a fenced yard or kennel. That the Buyer will groom, train and care for this dog in a manner consistent with high quality animal husbandry practices and those endorsed by the Breeder and the Golden Retriever Club of America. This dog will not be used for any purposes of research or vivisection and shall not be sold or given to any wholesale establishment, chain store, catalog sales house, pet store or puppy mill. That this dog will never be surrendered to any humane society, animal rescue group or animal shelter. Buyer releases Seller, Golden Rock Farm, and their estate from any and all liabilities, and/or damages by fault of this dog after the time of sale. These damages include, but are not limited to, destruction of property and/or physical damage to any person or group of people. This contract is made out in duplicate; the Seller and the Buyer each to receive one copy. WE DO NOT RECOMMEND YOU SPAY OR NEUTER YOUR GOLDEN UNTIL THEY ARE FULL GROWN. We highly recommend putting your puppy on Nu-Vet Vitamins, using Nu-Vet on a daily basis will extend your Health Guarantee an additional 6 months. You must use the Code 84013 when ordering online or by phone. Website - www.nuvet.com/84013 or call 800-474-7044.